Our opening times vary between 9:00am – 10:00pm. Times are subject to change depending on the season. Check here before you travel. Busch Gardens is located at the corner of Busch Boulevard and 40th Street on N McKinley Drive. 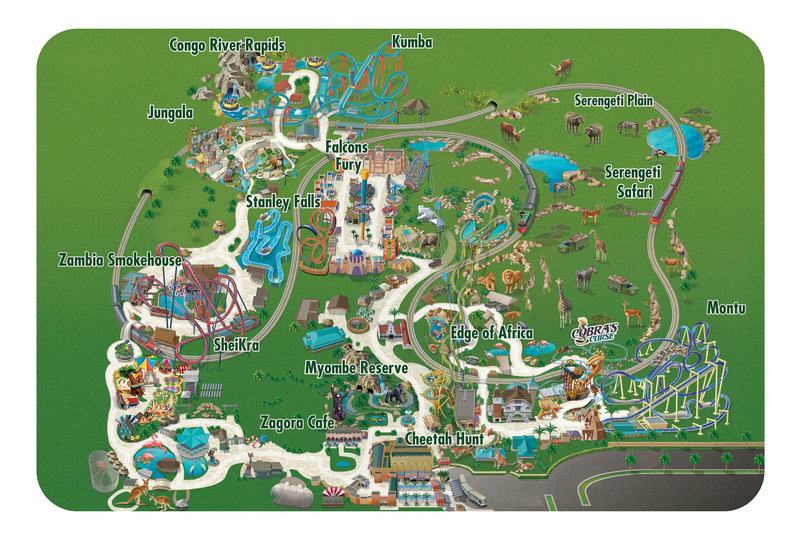 Busch Gardens is 8 miles northeast of downtown Tampa, approximately 1 hour from Orlando via Interstate 4 and 30 minutes east of area beaches and Tampa International Airport. 10165 N McKinley Drive, Tampa, Florida 33612. Turn east (right) onto Fowler Avenue and proceed 2.5 miles to McKinley Drive. Turn south (right) onto McKinley and proceed to the main parking lot entrance. Complimentary transportation is available on the Busch Gardens Shuttle Express for any guests who have purchased a Busch Gardens ticket. You should make a reservation in advance by calling 1-800-221-1339. Pay just once and enjoy a day of great food with Busch Garden’s All-Day Dining Deal. Every hour you can choose a main course with a choice of either a side course or dessert and a soft drink; ensuring you’ll have the energy to tackle Florida’s best thrill rides all day long. Reimagine the traditional culinary experience with market-style dining, featuring Italian, American, Southwestern and Asian cuisine. Plus, guests over 21 can enjoy the expanded beverage line-up with a selection of refreshing craft brews and cocktails. Menu includes: Shrimp Lo Mein, Rotisserie Chicken, Flatbread Pizzas, Paninis and Seasonal Fruits. Breakfast, lunch or dinner - head to Zagora Cafe for a variety of tasty food options. Hamburger Platter, Grilled Chicken Sandwich and Chicken Tenders. Children’s menu includes: Hot Dog Meal and Chicken Nuggets. Tame your appetite at Bengal Bistro. It's the perfect way to top off a visit to Jungala. Menu includes: Catch of the Jungle Fish, Wraps, Freshly Prepared Grilled Hamburgers, Chicken Caesar Salads, Italian Sandwich, Veggie Wrap and Meatball Sandwich Platter. After a thrilling ride on SheiKra, come here to satisfy your taste buds with some delicious smokehouse barbecue. Menu includes: BBQ Chicken and Ribs, Smoked Beef Brisket, Chicken Strips, Specialty Sandwich, Corn on the Cob, Smokehouse Baked Beans, Macaroni and Cheese, Hot Apple Cobbler and Warm Bread Pudding. Sit back, relax and enjoy a cold craft brew in the centre of the Bird Gardens at the Garden Gate Café. Menu includes: Oven Toasted Sandwiches, Fresh Baked Pizza, Chips & Queso and Soft Baked Pretzels. Sit down and enjoy a fantastic meal with a beautiful view overlooking the Serengeti Plain and new spin coaster Cobra’s Curse. Table service or a buffet-style meal are available. Buffet menu includes: Southern Fried Chicken, Beer Battered Fried Fish, Classic Jambalaya and Braised Pork. Table service menu includes: Grilled Chicken Breast Salad, Fish Sandwich, Tuscan Grilled Chicken Sandwich, Herb Grilled Salmon, Braised Short Ribs and Seafood Tower. What is the Busch Gardens Shuttle Express, and how do I book it? The Busch Gardens Shuttle Express is a free service for anyone buying a Busch Gardens inclusive multi-park ticket. This bus picks you up from SeaWorld Orlando, as well as various locations in Orlando and Kissimmee, and drops you off at Busch Gardens. Reservations are a must and these can be made by calling 1-800-221-1339 when you’re in the US. What time is my Serengeti Safari? Tour times are allocated on the day of your visit. We advise you to check in at the Adventure Outpost (inside the park) no later than 10:00am. You will then be advised when and where to meet your tour guide. Exchange your ticket for a wristband at the Adventure Outpost. Large hard or soft coolers, glass containers, food such as sandwiches, meals, snacks etc., and flavoured drinks may not be taken into the park. Water bottles may be taken into the park. Guests with special dietary needs, should contact Guest Relations. All-day self-service lockers are available for rent in the Morocco section of the park, near the entrance. The multi-use, keypad operated lockers can be used as often as you like throughout the day. Self-service kiosks accept cash and credit cards. Standard lockers cost $10 per day, large lockers cost $15 per day and jumbo lockers cost $20 per day. Selfie Sticks or any hand-held extension poles for mobile devices are not permitted on any ride. • Camera must be secured by a 3-point or more harness, over the riders shoulders and around the torso, that is snapped or buckled closed and cannot be detached by bumping. • Cameras with a case must be tightly snapped closed and the case must be securely attached to the harness with a screw-type pin or similar device. Similarly, an uncased camera can be directly and securely attached to the harness with a screw-type pin or similar device. ATMs are located throughout the park. MasterCard, Visa, American Express and Discover are accepted at all restaurants and gift shops with ID. Wi-Fi is available and free of charge for all guests. Simply search for the Busch Gardens network upon arrival at the park.